With my column this week, I did something I’ve never done before: I typed the entire thing on my iPad. That’s because I’ve been testing Logitech’s new Ultrathin Keyboard Cover for iPad, which has changed the way I feel about productivity on the iPad. You see, I’m not a huge fan of touchscreen keyboards. Many other consumers share this sentiment, as much as they might love their tablets. Hardware makers have addressed this by offering a variety of accessory keyboard options. They range from Bluetooth-enabled wireless keyboards to tablet cases with built-in keyboards, like the $70 Belkin YourType Folio, and plastic overlays that create tactile keys on top of the iPad’s touchscreen. Companies have even tried experimenting with laser-projected keyboards — though those still won’t give you keys you can actually feel. But some of these solutions are bulky, or add too much extra weight to the iPad. Not the $100 Logitech Ultrathin Keyboard. 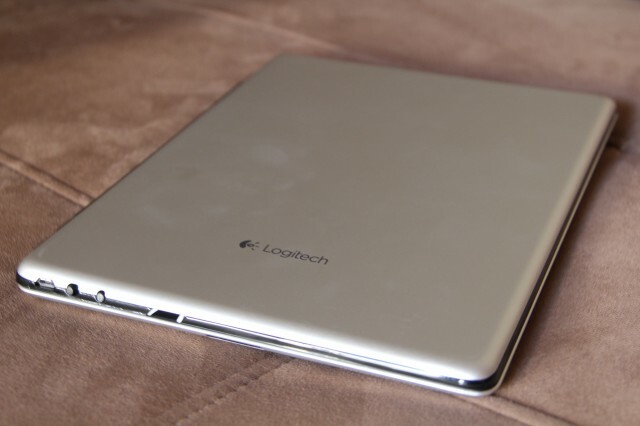 The successor to the Logitech Keyboard Case by Zagg, the Ultrathin is a sleek, super-slim Bluetooth keyboard that also works as an iPad cover. It works with both iPad 2 and the new iPad. I’ve been trying out the Ultrathin with an iPad 2 for over a week now, in part to determine whether it’s worth its $100 price tag. Despite the fact that it scratches easily and doesn’t firmly support the iPad when the tablet is in the vertical position, I would buy this device. The Ultrathin Keyboard Case is 9.5 inches by 3.5 inches. It’s just .39 inches thick — thinner than all three of the iPads themselves. Made of aluminum, it mimics the look of the back of the iPad. When the keyboard isn’t in use and the case is being used as a cover, it looks very much like you’ve mashed two silver iPads together. On its own, it weighs roughly 12 ounces. 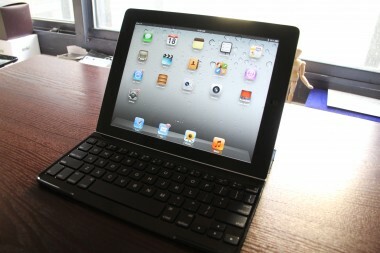 The combined weight of the case with the Wi-Fi-only iPad 2 is 2.071 pounds; the case plus the new iPad weighs 2.185 pounds. Like Apple’s own cover for the iPad, the Logitech Ultrathin Keyboard Cover comes with magnetic grips that firmly latch onto the long edge of the iPad. 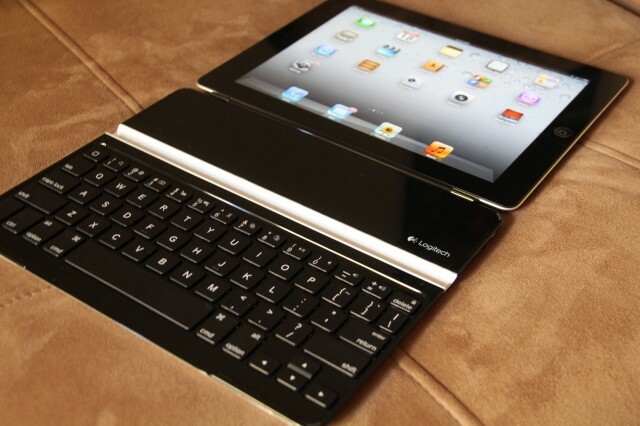 To get started using the Ultrathin, I powered on the keyboard, then turned on the iPad’s Bluetooth. The iPad quickly recognized the device, and I paired the two by selecting the keyboard from the iPad’s list of recognized devices. Next, I tested the keyboard. I positioned the iPad horizontally in a thin, white trough that runs across the top of the keyboard. The magnetic pull was so strong that the iPad snapped into place. This propped the iPad up at an angle in front of me, and I was ready to begin typing. Set in a smooth, black, recessed tray, the keys are black, Chiclet-shaped and made of etched plastic with slightly raised lettering. Despite the shallowness of the tray, the keys have a nice spring to them. Alternating between the touchscreen and the keys took some getting used to, but typing on the iPad using the Ultrathin was fluid and easy. I answered emails, jotted down some thoughts in the Notes app, filed a short blog post and wrote this column. I also used some of the shortcuts available through the function keys at the top of the keyboard: There’s a home key for returning to the iPad’s home screen, while the function key plus the “1” key launches spotlight search. Function and the “3” key makes the iPad’s virtual keyboard pop up, and function plus 6, 7 and 8 allow users to cut, copy and paste. 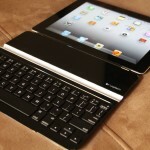 Logitech says the keyboard’s battery life is expected to last six months with two hours of daily usage. The keyboard also goes into sleep mode when it’s not in use for 20 minutes, thus conserving battery life. Charging it requires a micro-USB cord, which goes into a small port on the keyboard and a regular-sized USB port on your laptop or computer. Unfortunately, the $100 you’ll pay for this won’t cover the cost of a wall adapter. There are some less-desirable aspects of this product. For one, it only works with the iPad. 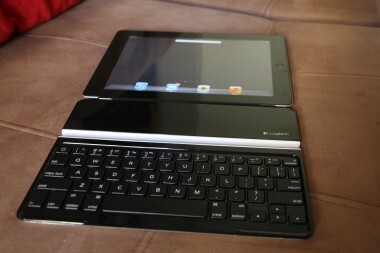 Logitech does make a $70 Bluetooth keyboard that works with Android tablets, but it’s a separate wireless keyboard. Another drawback: The “delete” key is way too small — one of the downsides of cramming an entire keyboard into such small physical real estate. It sometimes took me three tries to make contact with the delete key while typing. The Ultrathin only covers the iPad display screen, and not the backside of the iPad, which is prone to scratching. As it turns out, the cover side of the Ultrathin is also prone to scratching, as I discovered after a week of throwing it in my bag and toting it around. 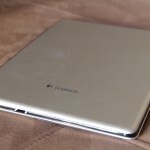 Users that don’t want to deal with scuffs or that are looking for more iPad coverage will likely want to consider something like the Belkin I mentioned earlier, the $100 Zaggfolio iPad 3 keyboard case, or Logitech’s $130 Solar Keyboard Folio. The magnetic clips that hold the tablet in place are super strong, but that’s only when it’s propped up horizontally. While, technically, the iPad can rest in a vertical position in the keyboard’s tray, it doesn’t feel like it’s firmly in place. Also, though I love how thin and lightweight this thing is, it’s so light that it sometimes creates an awkward balance between the keyboard and the iPad. When I was sitting on my couch, with my feet up and my iPad and its keyboard on my lap, it was fine. 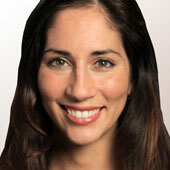 But when I was sitting upright in my desk chair with the iPad and Ultrathin on my lap, it felt a little unsteady. However, the benefits outweigh the downsides of this keyboard and case. I didn’t get to try out the Ultrathin on an airplane, but I did test it during a train ride. It was the perfect travel accessory, and now I can’t imagine traveling without it.